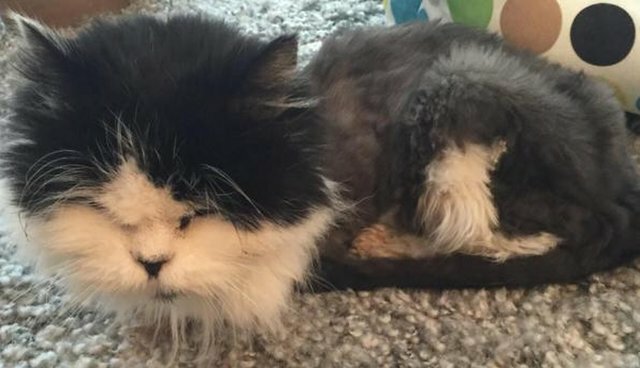 The old cat weighed just 3.6 pounds when she was found, her fur severely matted, in the parking lot of a hotel. Last November, a good Samaritan brought the 13-year-old Persian mix to San Diego Humane Society's Oceanside campus in California. Rescuers named her Joyce, shaved down her matted fur and started her on her road to recovery in cozy sweaters. Despite the way she had been abandoned, Joyce still had affection to give. "She instantly became a staff favorite with her sweet demeanor," Tanessa Higgs, guest relations manager at the San Diego Humane Society, told The Dodo. Joyce was quickly diagnosed with hyperthyroidism, a hormone disorder that speeds up the metabolism and causes rapid weight loss. Even though Joyce had a microchip, the Humane Society was unable to find her owner. She was described as "extremely social" with people and other cats, the shelter wrote on its Facebook page, with an "irresistible" personality. After staying at the shelter for a little over two months, Joyce's wishes for a forever home where she could be unconditionally loved came true. George, Fluff & Adelaide on Instagram: "Hello! I'm Adelaide and I'm the new #grannysister of George & Fluff. Im about 13 years old and my forever meowmy picked me up from the..."
Joyce, renamed Adelaide by her new "meowmy" Mendy-Sue Drew, is now thriving in her new home with her protective new brothers, George and Fluff. George, Fluff & Adelaide on Instagram: "Can you all see our little sister kitty getting ready for bed in her room behind us? We are like big brother lions watching out for..."
"She is eating like a champ so the vet thinks she will be healthy in no time," Drew told Love Meow. "She is quite the firecracker! So active and vocal and curious!" George, Fluff & Adelaide on Instagram: "SOUND UP. They have some great breffast at this new place! I could really like it here! Maybe I could gain a few ounces!..." Older cats like Adelaide typically have a harder time getting adopted. Higgs spoke about the many benefits that come with choosing an animal in her golden years. "Their personalities are already established, so what you see is what you get," she said. George, Fluff & Adelaide on Instagram: "I've discovered this wonderful scratching post and a big windowsill where I can people watch all day ....lots of four legged furry things..."
"They need less attention than kittens, which would work great for a household where people are outside of the home often ... not to mention that their cute gray faces just melt your heart," she continued. George, Fluff & Adelaide on Instagram: "Bye everyone! I'm on my way to the spa now....I hope they can make me purrty:). I know, I'm already purrty but I'm hoping they can help me..."
Luckily, Adelaide was able to find her happy ending - with sweet princess hoodies to boot. George, Fluff & Adelaide on Instagram: "I don't know why my brothers get so excited about Mondays.....I can't even......ð¤ð¤ð¤ð¤ #spoiledkitty #adoptedandloved #rescuedandloved..."
Interested in giving an older pet a forever home? Get started at Adopt-a-Pet.com.